This is also from my mom's kitchen and I bet u can't resist eating once u make this .... Trust me gals, it's drool worthy !!! Tomato -- chopped -- 1 1/2 nos. Green chillies --cross slit open -- 2 nos. Pressure cook the mutton pieces with GG paste and little bit of salt for 7 to 8 minutes or until it's tender. Grind the ingredients given in the seperate table to make fine masala powder..Actually adding fennel seed powder gives nice aroma to meat as well as fish. So, I always grind it and keep it in an airtight container,that makes the job easier..:)Take a kadai and pour the cooking oil. Add the onion and the green chillies when the oil is hot and fry till it turns golden brown. Dump in the masala powder and saute for 2 minutes till the raw smell disappears.Now add the chopped tomato and cook till it gets mashed. Throw in the red chilli powder,coriander powder,salt and cook for a minute or so. Finally dump in the cooked mutton pieces along with the soup and scald well. Cover and cook till the water is almost reduced. Keep an eye once the water is reduced otherwise it might get burned. 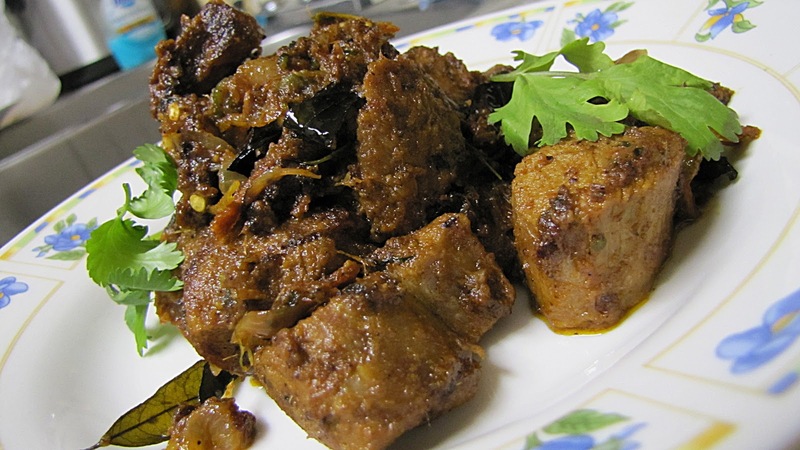 Now ,fry the curry leaves in the coconut oil seperately (u may even do the process in a microwave) and dump the entire mixture (i mean ,curry leaves and the oil) to the already mutton fry and combine well. Fry this until everything comes together..And Njoy !!!! U may have this with rice or roti's..Or u may even make a lamb Quesedilla...Or a lamb Burrito....IT would be yummy....!!!! 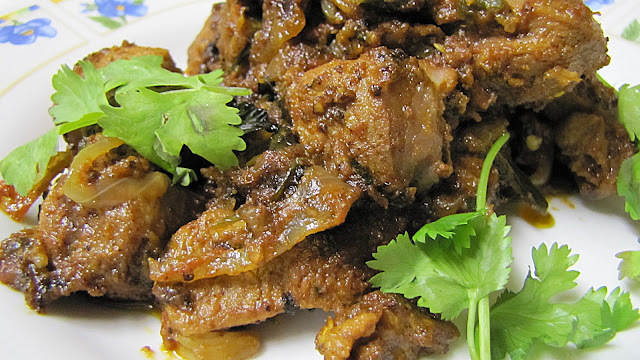 Shanavi mutton fry is perfect and inviting. Slurp, fingerlicking tempting mutton fry..
Mutton fry looks mouthwatering,wish i cud grab that plate! Looks so yum..makes me drool.